Have you ever received a message similar to the following: “This is Kennedy Elementary School, could you please contact us at your earliest convenience to discuss a meeting time regarding your child’s academic progress?” You more than likely panic, wondering what is going on as many questions and scenarios run through your head. When you speak to the school representative, you will probably hear all kinds of terms and letter abbreviations that may add to your alarm. If you have a school-aged child, you’ve likely heard many acronyms used to describe processes, policies, and programs utilized to help your child succeed in the academic environment. By understanding how this process works, you can calm your apprehension while educating yourself on the best ways to take a team approach in helping your child succeed. In this multi-part blog series, we will examine the RTI process and how it works in conjunction with an IEP meeting and an IEP Placement. To comprehend the academic model for advancement, you must first know that each grade level has standards for behavior, academics, and development. To understand where your child falls in each area, educators give assessments throughout the year. Some assessments are formal (quizzes, tests, standardized tests) and some are informal (observations, rubrics, anecdotal records). Many pieces are used to determine where your child fits. If your child’s teacher has a concern about a certain area, she will consult with her colleagues and together determine if further measures are needed. 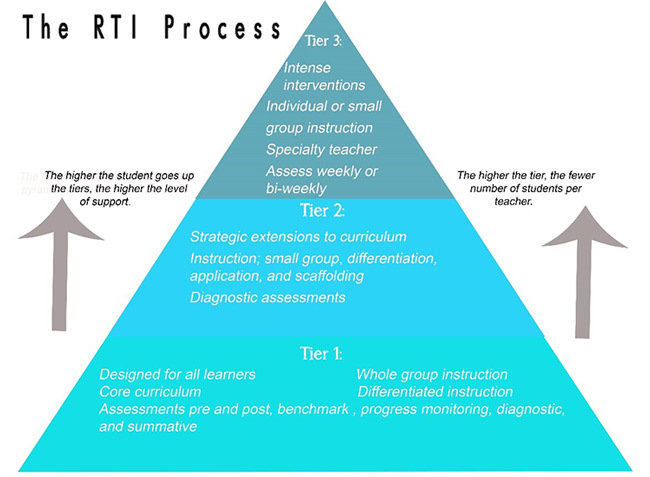 It may be determined that the teacher starts a process known as RTI. Let’s look at the RTI process, and some of the other acronyms that may be present in this type of scenario. Within Tier 1, all students receive high-quality, scientifically based instruction provided by qualified personnel to ensure that their difficulties are not due to inadequate instruction. All students are screened on a periodic basis to establish an academic and behavioral baseline and to identify struggling learners who need additional support. Students identified as being “at risk” through universal screenings and/or results on state or districtwide tests receive supplemental instruction during the school day in the regular classroom. The length of time for this step can vary, but it generally should not exceed 8 weeks. During that time, student progress is closely monitored using a validated screening system such as curriculum-based measurement. At the end of this period, students showing significant progress are generally returned to the regular classroom program. Students not showing adequate progress are moved to Tier 2. Students not making adequate progress in Tier 1 are provided with intensive instruction matched to their needs. These services and interventions are provided in small group settings in addition to instruction in the general curriculum. This period may take longer than the first tier, but it should not exceed 9 weeks. If students continue to show little to no progress at this tier, they can then be considered for more intensive intervention in Tier 3. At this tier, students receive individualized interventions that are even more intensive than Tier 2. At this stage, if the student continues to show little adequate progress, they will be referred for a complete evaluation and considered for eligibility for special education services under the law called IDEA 2004 (Individuals with Disabilities Act 2004). The data that is collected during the other tiers will be used to determine special education eligibility. If you, as a parent, feel at any point you would like to request a formal Special Education Evaluation, you may do so under IDEA 2004. The tiered process of RTI cannot be used to deny any parent this request. If you have further questions, or are interested in learning more about the process, contact Dynamis Learning Academy by clicking HERE to set up a free consultation. We have certified teachers (i.e, 504 chairs or special education) who can help you better understand this process. Next week, we will examine what happens during the Special Education Evaluation and the difference between an IEP and a 504 plan, and how you should approach an IEP meeting. What Do These Mean in an Education Setting and How Can They Help Your Child?